Howdy, Gang of Four! Welcome to your Friday! For those of you that know me best, you know I’m a sucker for all things retro. Retro gaming, retro commercials, retro comics, you name it, if it ain’t from this decade, I’m all over that like gravy on meatloaf. This is especially true when it comes to retro things from the decade in which I was a youngster: The 1980s. Ah yes, the time when my Universe was dominated by He-man, Happy Meals, and Cap’n Crunch with Saturday morning cartoons. And when it came to video games, it was all Atari in those early years. Well, scratch that. It was all Arcade games, those were my real bread ‘n butter. But those could get expensive for a kid that was also saving for toys and comic books, especially when you are young and not very good at it so you run out of lives fast. So our Atari at home was where I honed my early skills on games like Centipede, River Raid, and Popeye. And during that boom of Atari games before the big crash, there were a wide variety of games to choose from for that system. Some good, some bad, some downright toxic. But the one thing most of them was looking for was “the hook”. You see, unless you were an arcade port like Pac-man or Donkey Kong or just plain incredible like Pitfall, in order to differentiate itself from the pack, most Atari games needed some sort of hook. This is especially true when the actual game itself was either poor or downright unplayable. 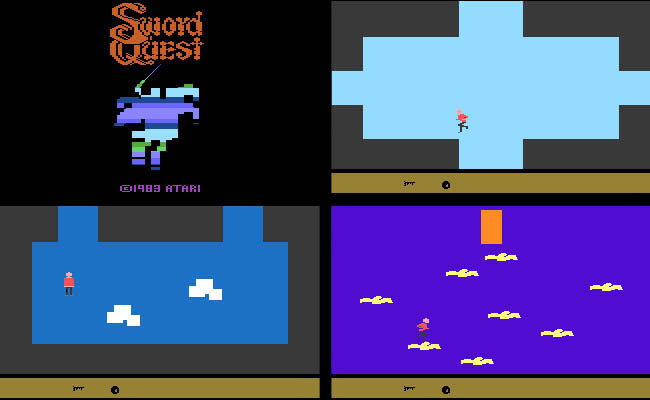 The Sword Quest series for the Atari 2600 is one of those such games. Despite it’s importance from a historical perspective as being one of the earliest attempts to combine the narrative and problem solving elements of the adventure game genre with the faster paced gameplay of the action genre, making this series one of the very first ‘action-adventure’ games, long story short, unlike the Raiders of the Lost Ark game which was similar in it’s concept, the SwordQuest series is just plain bad. However, that didn’t stop the minds at Atari from building an elaborate promotional machine around the series in hopes of boosting its sales. You see, each of the games came with a comic book that explained the plot behind the video games, as well as containing part of the solution to a major puzzle that had to be solved to win the contest that coincided with the release of each of the games in the series. This contest contained with a series of prizes whose total value was $150,000. Now I could write an entire blog about the backstory of the actual contest behind SwordQuest including some fascinating nuggets of video game lore such as how the 4th and final chapter of the series, Air World, was cancelled due to the great Video Game Crash of 1983. Or how one of the eventual winner of the grand prize from the EarthWorld game ended up melting down the “Talisman of Penultimate Truth”, an 18-karat gold disc inlaid with diamonds and birthstones from the various zodiac signs, along with a miniature white gold sword set atop it, to pay for his college tuition. Now as a long time collector of Masters of the Universe figures, I’m no stranger to the notion of packaging comic books in with merchandise to help kids develop backstory to their toys and fuel their imaginations. I’m also very aware that MOTU wasn’t the only ones that did this, and those that followed in their footsteps did so with varying degrees of quality in terms of story and art. However in the case of SwordQuest, from the word “GO” this particular comic book tie in does have a couple things going for it. 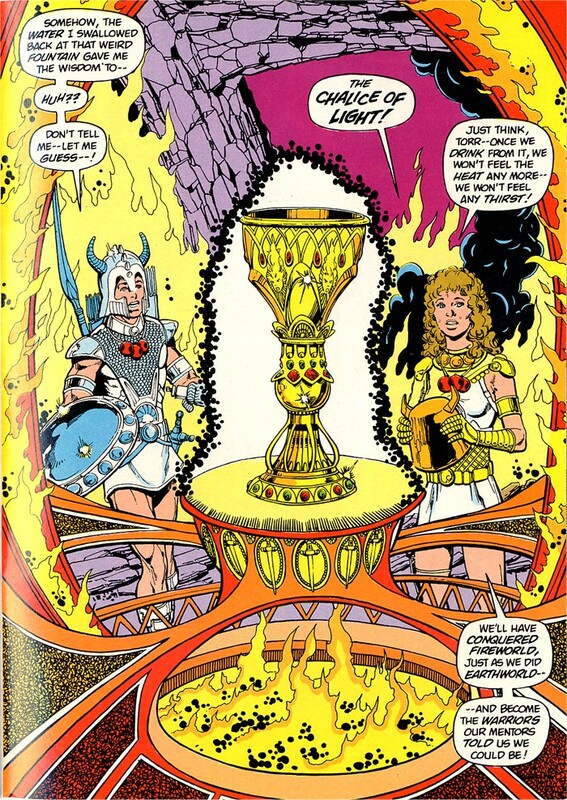 First it’s got absolutely fantastic art by George Perez at the height of his comic book prowess from a time when he just completed solid runs on both the Avengers and more recently his legendary run on New Teen Titans. Sincerely, I was trying to remember whether I ever read a comic in which Mr. Perez got to really got all out with the fantasy swords/sorcery genre. I think the closest I could remember was early issues of his late 90s run with Kurt Busiek where the Avengers are magically casted back into the Middle Ages. But even with that story, there’s still a lot of images that are more grounded in reality. His work on SwordQuest, what with all manner of mythological beasts, giant dragons, pirate ships made of solid ice, evil wizards, etc. is sincerely a marvel to behold in terms of his ability to craft such an awe inspiring fantasy world from the ground up. Coming in second, is fairly solid writing by the incomparable Roy Thomas, who definitely knows a thing or two about spinning quality fantasy yarns. Whether it was his massive run on Conan the Barbarian, his adaptions of some of the Michael Moorcock epics like Hawkmoon or Elric, or even his somewhat forgotten series like Arak, Son of Thunder, Roy Thomas has the chops to build a Tolkenesque universe and fill it with all the classic fantasy tropes to see it succeed. Roy gives us a plucky pair of roguish twins as our heroes, children of the most famous warrior in the land until he was betrayed by the power hungry son of the king and his devious wizardly accomplice. Led on by fate and destiny to seek a fabled sword to aid them in their quest for vengeance, the two travel through 3 mystical worlds together collecting both experience and various treasures that help them become the champions they need to be to in order to overcome the wicked usurper and reclaim their birthright as the rightful rulers of the land. Sounds pretty good, right? Well, yes and no. The story definitely hits a lot of the right notes. There’s plenty of high adventure with Earthworld being populated by creatures inspired by the Zodiac signs, such as Taurus the Minotaur and battle with a Centaur archer representing Sagatarius. There are tentacle monsters and fire imps to battle in FireWorld. And of all the issues, Waterworld is the best with its story of a centuries long war between the surface ship sailors and the aquatic race with which they seem locked in some ancient blood feud. Sure it seems a little cliche at times, a little forced at others what with the unbelievable luck these twins have at times, but that’s not what causes the whole story to taste like as we often say on our podcast “A fart sandwich”. Despite the great art and story, there’s a real elephant in the room as to why the whole thing still doesn’t work. 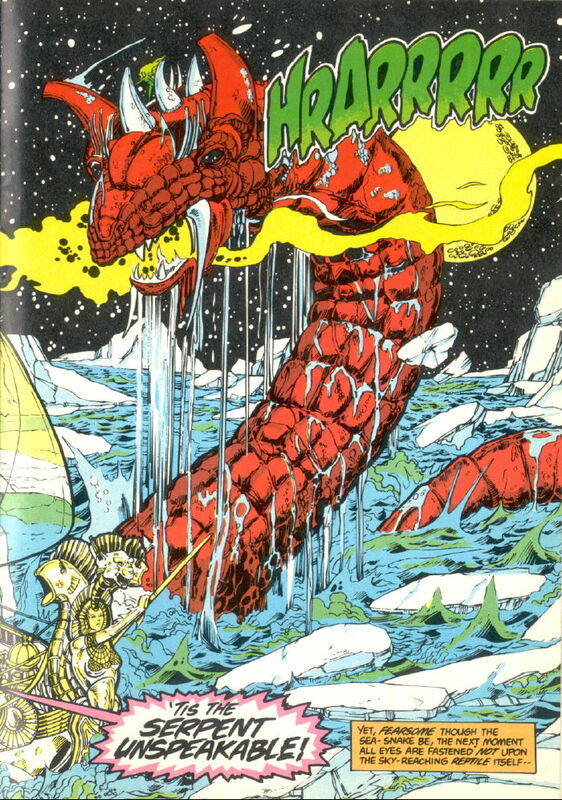 I don’t think it would be fair to talk about this book and not mention the fact that again, despite the unbelievable fantasy world this comic convinces the reader exists within SwordQuest, the actual game itself is pretty much garbage. It’s like the biggest conceit of this entire enterprise in that the comic paints this picture of this game as a rich visual experience filled with swordplay against unearthly monsters, harrowing descendants into ancient caverns, wars between blood thirsty pirates and a beautiful but deadly mermaid enchantress. And yet if you see below, this is pixelated mess you actually get from the cartridge. Poor graphics, confusing if not impossible game play, nothing like what’s promised by the comic. No wonder people flocked to games like Legend of Zelda when they first came out. At least that game delivered on a competent fantasy storytelling within the game. I mean, seriously, the comic seems to promise something that’s more like Skyrim than what could be delivered on the meager technical capabilities of the 2600. I just know if I read this comic back in 1983 and then attempted to play this hot garbage, thinking I was going to get a similar experience, I would have thrown my joystick out the window before demanding my money back. I mean no wonder the Great Crash happened if these were the games they were pushing down the consumers throats in those days. And I do think that does sour my view of the comic even more in retrospect. You see despite it having fantastic art and competent writing, this book never escapes the notion that it’s all just one colossal corporate shill. A corporate shill created solely to back a video game series which is pretty god awful and which Atari couldn’t even finish, thus the story also ends without anything remotely resembling a proper conclusion. The Heroes just fly off to Air World leaving the reader hanging as to whether the twins will ever get their revenge. Sure, it’s probably a given that they will as it seems like the type of story that will lead to a happy ending, but again we are never given a chance to see it. Yep, you just can’t shake the feeling that for whatever merits the book might have it’s tarnished by being hooked to a failed project and the fact that it never progressed beyond that level. Trust me. I’ve read my fair share of comic books based off licensed properties in my day. Some of them are good because they are lucky enough to be based off winning projects (Star Wars, MOTU, Transformers) and thus even when they occasionally miss, there’s still enough to keep you interested. Conversely, there are plenty of licensed comic books (Rom the Spaceknight) which were based on clunkers that rose above whatever shortcomings the source materials had to tell solid stories that were good just on their own. SwordQuest unfortunately is neither. And that’s sad because there are some good ideas going on with these books. 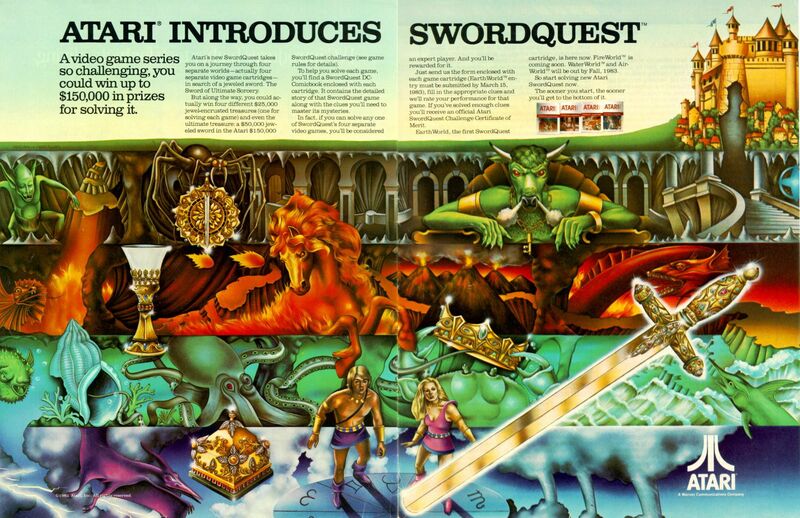 I almost wish there had never been a SwordQuest game, and that this was just a series Roy Thomas and George Perez did at DC Comics in the early 80s to cash in on the fantasy dollars and interest games like Dungeons & Dragons was generating. Instead it’s good ideas and interesting visuals will forever be linked to this terrible video game and it’s legacy of failure, and as a result it will always roast in the fiery pits of mediocre, any possible greatness obscured for all time. Yeah, that was a thing with a lot (i mean a LOT) of the Atari Games. Very nice cover design, making a young heart beat faster, waking the desire to own that thing, and then – pure dissapointment. On the other hand, there were a bunch of titles which really WERE fun. So i will never regret spending so much time on that machine. Let´s not forget the social aspect. Years away from online gaming (which i mostly still don´t like very much) we were gathering around the machine in numbers of 3,4 or even 5. Oftentimes not even playing, just watching and participating with “useful” hints and tips for the one playing. Really, forget online gaming. It just can´t compare. I am still am an enthusiastic video gamer. And even if most of the games today are more deep, more complex, i often find myself longing for the simplicity and comraderie of those early years – and of course the Atari Joystick, this peace of nearly indestructable hardware (must been made out of pure uru). It was not the most handfriendly thing to play with, but we were so used to it it seemed to be the only thing to use, to really get to a high score. We were using it for many years, even while moving forward to C64 and Amiga. Thanks for these great oldschool videogame articles you present here from time to time. The are really taking me back.